This stylish stone and stucco home features a partially finished walkout basement for sloping lots. The foyer is vaulted, receiving light from two clerestory dormer windows, and includes a niche for displaying collectibles. The generous great room enjoys a dramatic cathedral ceiling, a rear wall of windows, access to two rear decks, a fireplace, and built-in bookshelves. 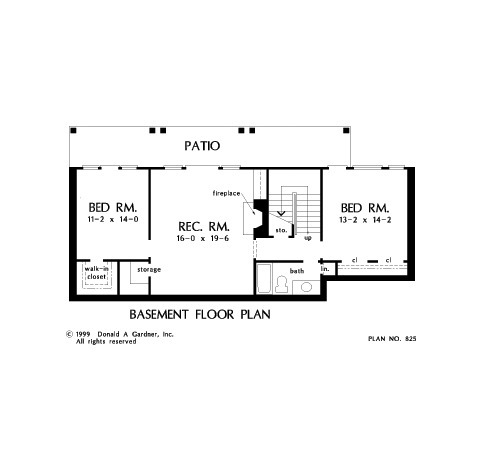 A recreation room is located on the basement level. Two bedrooms can be found on the first floor, while two more flank the rec. room downstairs. The master suite boasts an elegant tray ceiling, his and her walk-in closets, and a luxurious bath with dual vanities, garden tub, and separate shower. 1st Floor: 1901 Sq. Ft.
Porch - Screened: 148 Sq. 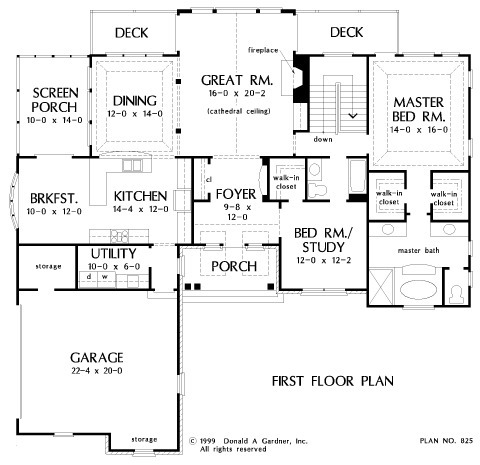 Ft.
House Dimensions: 64' 0" x 62' 4"
Great Room: 16' 0" x 20' 2"
Foyer (Vaulted): 9' 8" x 12' 0" x 19' 0"
Porch - Front : 14' 0" x 6' 4" x 0' 0"
Porch - Screen : 10' 0" x 14' 0" x 0' 0"
Deck / Patio : 12' 4" x 6' 4" x 0' 0"
Deck / Patio #2 : 14' 10" x 6' 4" x 0' 0"
Storage (Other) : 4' 6" x 5' 2" x 0' 0"
Storage (Bonus) (Sloped): 3' 7" x 6' 4" x 0' 0"
Other : 16' 0" x 19' 6" x 9' 5"
Other #2 : 43' 10" x 6' 4" x 0' 0"
Great Room (Cathedral): 16' 0" x 20' 2" x 19' 0"
Kitchen : 14' 4" x 12' 0" x 9' 0"
Breakfast Room : 10' 0" x 12' 0" x 9' 0"
Utility Room : 10' 0" x 6' 0" x 9' 0"
Garage : 22' 4" x 20' 0" x 0' 0"
Garage Storage : 8' 0" x 6' 0" x 0' 0"
Master Bedroom (Tray): 14' 0" x 16' 0" x 10' 6"
Bedroom / Study : 12' 0" x 12' 2" x 10' 0"
Bedroom #3 : 13' 2" x 14' 2" x 9' 5"
Bedroom #4 : 11' 2" x 14' 0" x 9' 5"